« Stay Rad Wine Blog TV Episode 37: Numero Uno? Last month, they come through with a badass component tasting of the 2011 Monte Bello (letting Monte Bello Collectors taste each of the four possible varietals that could end up in the 2011 Monte Bello). Back then, I was stoked to the hella on the assemblage. This past Saturday, I headed back to the winery up above the city of Cupertino for the First Assemblage Tasting event. The 2011 Monte Bello is coming along fantastically (and still bringing mad espresso notes!). But this post ain’t about that… Well… This ain’t entirely about that. 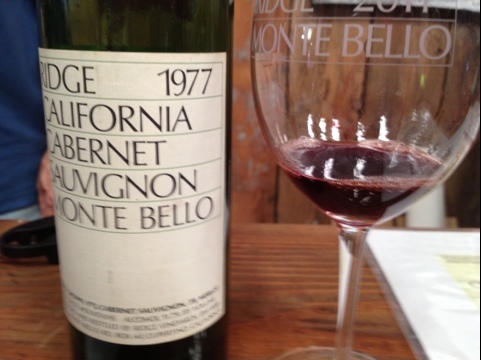 I think the beauty of the Ridge Monte Bello is its ageability. Color-wise, this Monte Bello was a rusty orangish brick-red with mad sediment in the glass. Nose of soft red fruit. On the palate, the fruit is subtle. This wine is all mouthfeel. Smooth and smooth. There’s a hint of sun-dried tomato, and lots of rubber. There’s something fun about a wine this old that still gives pleasure to the consumer. The grapes that went into this wine were picked almost 35 years ago. When this wine was in the barrel, I was in my mother’s womb. There’s something fun about knowing that the Monte Bello I’m purchasing now will be here, giving me pleasure 15, 20, 30 years from now. Sometimes you gotta look forward by looking back. This entry was posted on April 30, 2012 at 6:09 pm and is filed under Uncategorized. You can follow any responses to this entry through the RSS 2.0 feed. You can leave a response, or trackback from your own site. Very, very, cool! ’nuff said. oldest wine i’ve ever had was a 1996 haut brion. I did not pay. It was what first got me into wine. I was thinking the whole time that i was 7 when it was initially bottled which boggled my mind! Please hit me up the next time you don’t have to pay for a Haut Brion. I’d be more than happy to share it with you.